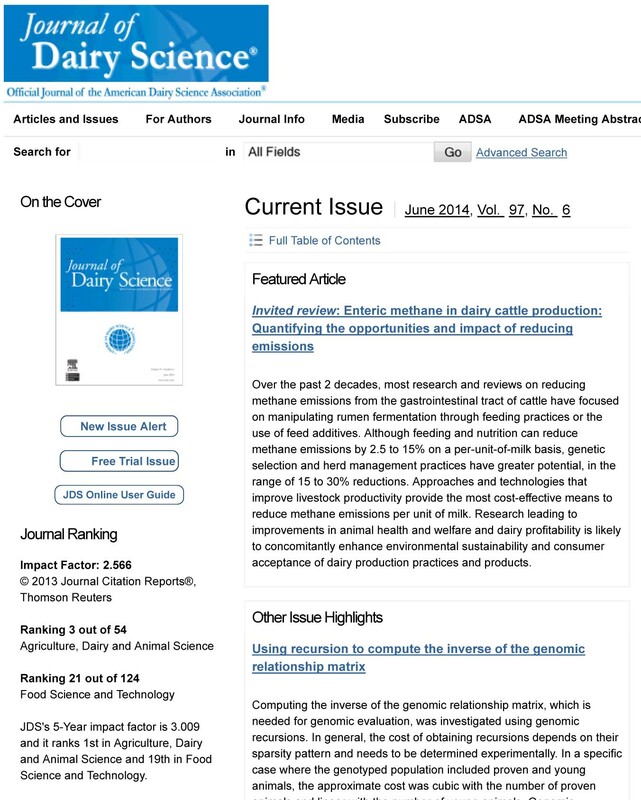 Dr. Joanne Knapp, adjunct faculty member, and Dr. Bill Weiss, professor, are among the authors on an article in the June 2014 issue of Journal of Dairy Science, which is the "Featured Article" of the month as selected by the editor-in-chief, Roger Shanks. The article, "Invited review: Enteric methane in dairy cattle production: Quantifying the opportunities and impact of reducing emissions," is displayed on the journal's home page this month. Link to the article below. Dr. Jeff Firkins also made significant contributions as chair of the Cow of the Future team, which produced the white paper that was the foundation of this manuscript. See the full JDS reference in the Publications list below. J.R. Knapp, G.L. Laur, P.A. Vadas, W.P. Weiss, J.M. Tricarico. 2014. Invited review: Enteric methane in dairy cattle production: Quantifying the opportunities and impact of reducing emissions. Journal of Dairy Science. 97 (6) 3231–3261.